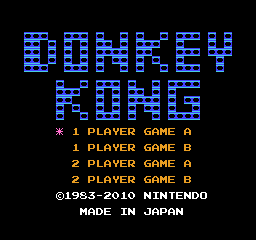 Donkey Kong doesn't really need much of an introduction. Despite missing an entire level (the so-called "pie factory"), the NES port is otherwise faithful to the arcade original. Lurking within the ROM are a handful of objects that never appear anywhere. The first two seem to be early versions of the handbag and parasol; the hat appears in the arcade version, but not the NES port; and the bouquet of flowers doesn't appear in any version, though it probably would have served the same purpose (bonus points) as the other items. Sprites of Mario and Pauline sitting, possibly meant for a different ending. There are more code differences.. In the original Revision 0 version, Mario cannot move at all when the D-Pad is held diagonally. In the more common Revision 1 version, the controller reading code was improved so that the first direction pressed has priority: if the D-Pad is rolled from Up/Down to diagonal Mario will not start walking, but if the D-Pad is rolled from Left/Right to diagonal he will not stop walking. The controls have been slightly modified so the player can press Up and Down to switch between options at the title screen. To commemorate the 25th Anniversary of Super Mario Bros., a limited-edition red Wii was released. 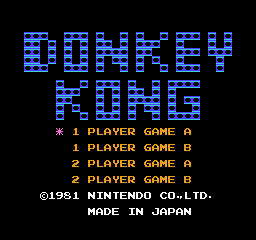 In Europe, this came with a modified Virtual Console version of Donkey Kong pre-installed that follows the arcade version more closely (rather than, you know, actually releasing the arcade version). This new version also received an official release on the 3DS in the United States during the last few months of 2012, via a limited-time Club Nintendo promotion. Shortly after the game's release, the ROM was extracted from its WAD container and distributed online, at which point it was discovered that Original Edition is nothing more than a hack of the original retail ROM...and a rather sloppy one at that. The copyright date adds "-2010", with "1981" changed to "1983" as that was when the Famicom version was released. The text "CO.,LTD." was removed, and "MADE IN JAPAN" was moved over one space. Before being soft-patched, the 3DS version lacked the copyright symbol and showed a copyright year of 2008, possibly indicating the originally planned release was to coincide with the 25th Anniversary of the Famicom version. 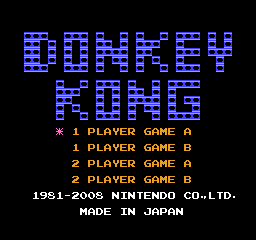 50M (the "pie"/cement factory), commonly omitted from Donkey Kong ports of the 1980s due to memory limitations, is present. 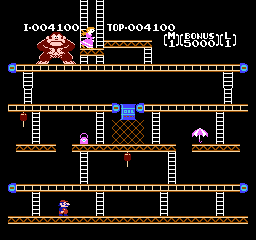 Donkey Kong now carries Pauline up the ladders to the next level, much like the arcade version. This page was last modified on 16 February 2019, at 11:53.